The third and final leg of the LEC Trophy was originally scheduled to be fished on the Chichester Canal at Grosvenor Road. However Steve Simmonds fished there in the previous week and caught one roach in four and a half hours so I decided to change the venue to Stemps and fish it as a silverfish match. In the Pairs match fished a couple of weeks earlier, on Stemps, several silverfish had been caught so it was a reasonable alternative venue. However once again we had overnight rain with a drop in temperature. The match was fished under very windy conditions making tackle control difficult. We also had the full gambit of weather with hail, heavy rain and bright sunshine at points throughout the day. There were very few silverfish caught but Keith Hughes and his grandson Cody both caught 10 carp each from Pegs 1 and 2. In first place was Colin Bridger who was fishing Peg 13 and used the long pole and maggot to catch skimmers and roach weighing 1-12-0. 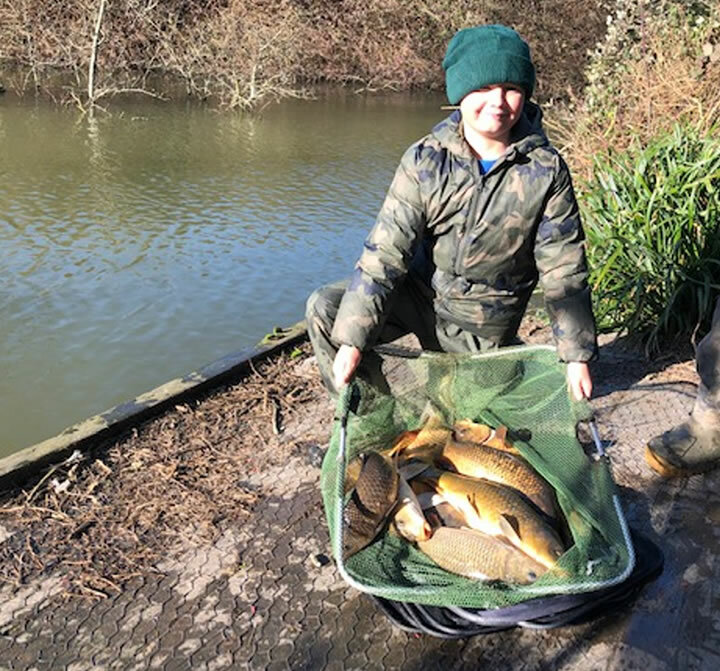 Mick Greenway was fishing Peg 7 and fished pinkies and dead maggots over groundbait to also catch roach and skimmers, on the long pole, weighing 0-15-0. Keith Hughes fishing Peg 2 took third place and as well the carp mentioned above also managed to catch some roach and a skimmer weighing 0-7-8. Cody may not have been placed but he had great fun catching these carp.